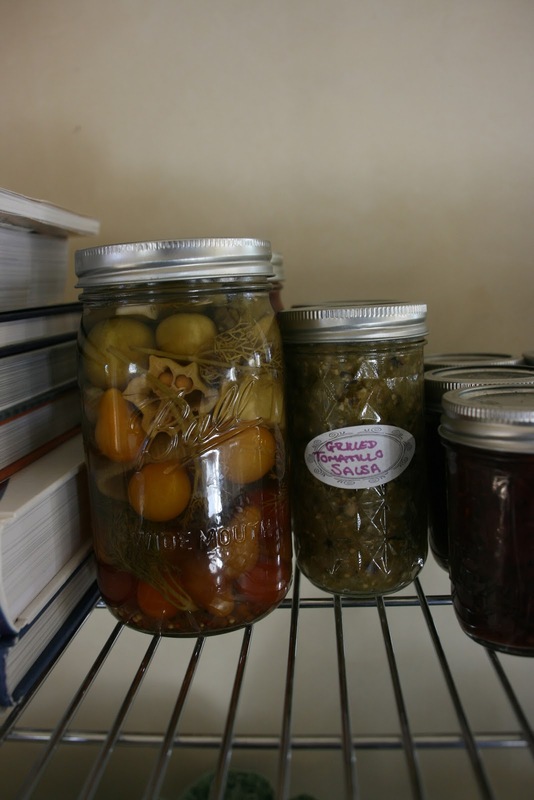 Our daughter and son-in-law have been busy making jams, jellies, salsa and pickles from our grapes and tomatoes. I decided to display the fruits of their labor on the open shelving in our Asti kitchen. There is something so satisfying seeing the jars on display, like a real farmhouse kitchen. 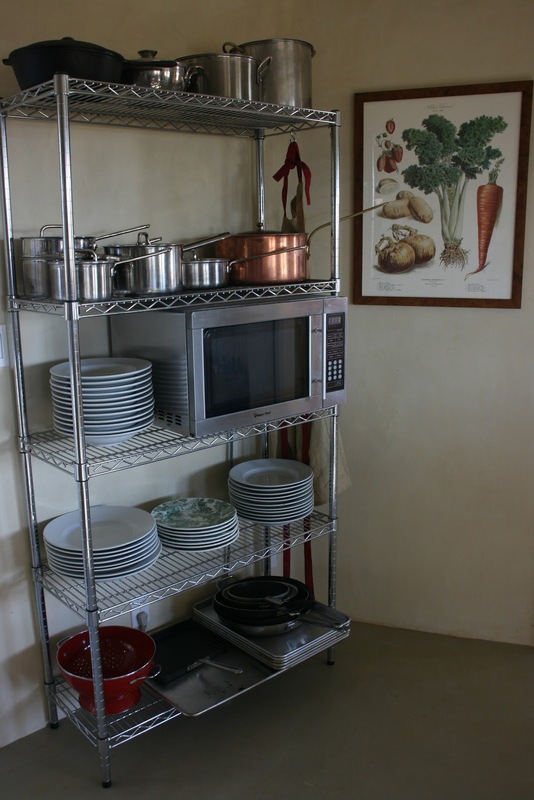 So with the addition of the jars, came the opportunity to restyle and generally clean up the shelves. They were a mess from Thanksgiving and from lack of attention! 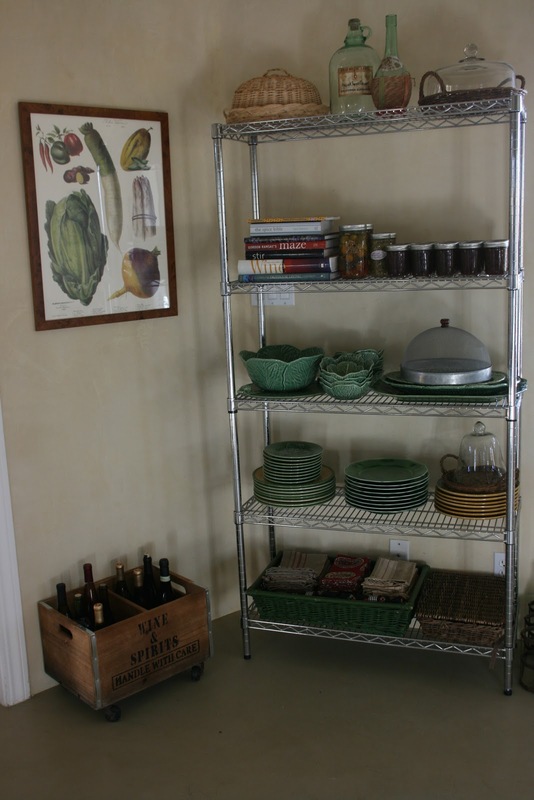 This wooden cart, a recent find from OKL found a home in the wine country! ....the left corner of the kitchen! Since I'm at it, might as well restyle the dining room table. Nothing special, just an antique wine cask waiting for a bunch of olive branches. Nothing has changed on the hutch. I just love these plates though and had to capture this vignette! It really is time to restyle the hutch, don't you think? But when something works, why change it? It all started with a bunch of jars, aka "a can of worms!" A big thanks to my daughter and son-in-law for all their hard work putting up our produce as well as their own. I agree, the hutch looks beautiful as is, but, if you change it up, I'm sure it will still be gorgeous just like everything else you do! Beautiful, Delores. The metal shelves are so handy. My husband installed these in our attic so I'd have storage space for all my dishes. LOL Our kitchen has limited cabinet space. I agree, the hutch looks terrific as is, but your creative juices just might decide it needs a change one day. The canned goods look cute on your Metro shelves but they should really be stored in a dark cool area to preserve the contents as well as possible. There is nothing like seeing the fruits of ones labor displayed for all to see. Love the shelves too! Anything that wonderful should be on display! Every time I see my jars of fig preserves that I put up this summer it makes me glad…I'm really glad that I have them and plan to give them as gifts this Christmas! Love your hutch, your dining room table and your kitchen shelves! Just beautiful! Very cool looking and I love that wine cart! !